The Pittsburgh Penguins Foundation has received a $175,000 donation from the Pennsylvania Department of Conservation and Natural Resources (DNCR) to revitalize The Cascades in Pittsburgh, Pennsylvania’s, South Park, one of the city’s oldest parks. The Cascades at Stone Manse, the brainchild of Swiss park designer and conservationist Paul B. Riis, comprises a series of shallow wading pools constructed of stratified rock quarried from the parklands. Built 90 years ago, the structure fell into disrepair and was closed for health violations in the early 1970s. Although some of the rocks remain visible, the falls now lie overgrown and defunct. The idea to restore the falls re-emerged around fifteen years ago, but financing for the project had been a challenge until private foundations stepped in to meet the ballpark estimate of $1 million. Allegheny County, the Pittsburgh Penguins Foundation, Allegheny County Parks Foundation, the Citrone Thirty-Three Foundation, and DCNR have joined in to finance the project, although the breakdown between private and public funding is yet to be determined. Dry for nearly 50 years, The Cascades at South Park was not always so. 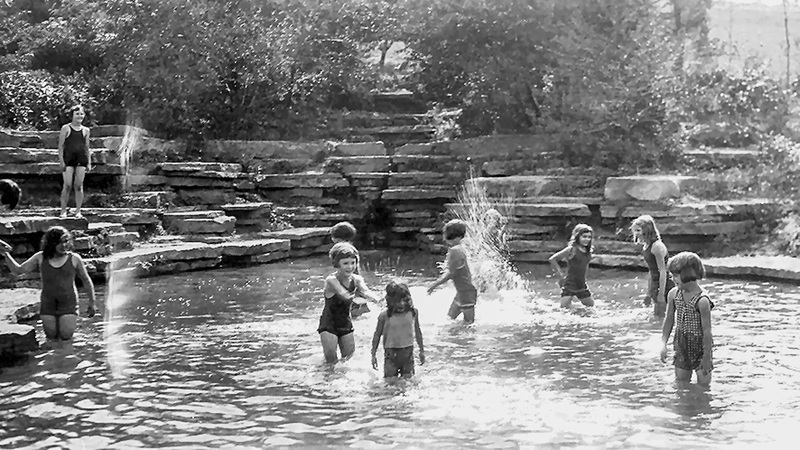 Many remember the falls as a destination that offered respite from the bustling city and summer heat—a place where children swam and played. One of the defining features conceived for the 2,013-acre park by Riis, the strategically placed rocks form a chain of waterfalls and wading pools fed by spring water. Among those designers who developed parks in the manner of the “naturalistic school,” Riis was part of the movement in American parks that emphasized the use of native species and natural materials to integrate manmade structures, making them seem like an act of nature. In the original park plan, this allowed the park’s roads, picnic areas, shelters, and even a dramatic mammoth stone swimming pool to blend seamlessly into the native surroundings. Riis designed and developed the Allegheny County Park system from 1927 to 1932. A marriage between practicality and artistry, his works were strongly influenced by Prairie School landscape architect Jens Jensen, whose design vocabulary is echoed in the parks’ rockwork pools, waterfalls, and large council rings. The South Park’s swimming pool, which opened in 1931 as the country’s largest naturalistic swimming pool, is considered the zenith of Riis’ designs. TCLF added the North and South Parks to its Landslide program in 2009, after decades of budget cuts left them in a decrepit state. The 2011 master plan developed by Allegheny County to deal with the most urgent issues makes little mention of the sites’ historical significance or key elements, while repairs have often been incongruous and not in keeping with the site’s historic character (e.g. the former pool site was converted to a go-kart track and the former bathhouse received a new roof). Meanwhile, additions such as skate parks, brightly colored playgrounds, memorial sites, and expanded parking lots have impacted the natural rural character of the original design intent. The proposed work will aim to restore and rehabilitate historic features, including the very stones quarried in 1927 and the native plantings. The uncovering of the original pool structure, currently filled with debris, began some time ago with the help of teen volunteers. The restoration of The Cascades will be the first of many projects through the Penguins’ Foundation’s newest initiative, Operation Restore. The project is still some $250,000 short of its target, and a crowdsourcing page has been established in the hope that public donations will fill the gap.